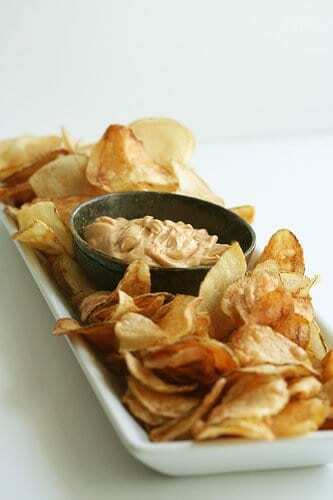 My favorite dip is a Cumin-Sweet Smoked Paprika Aioli that I got from Florida Trend Magazine’s Top New Restaurant Martini’s & Tapas where I teach cooking classes at. Instead of making aioli fresh from eggs, I cheat and use store bought mayo. Two unlikely spice combinations of Cumin and Sweet Smoked Paprika just go together but you just don’t know why, kinda like Travis and Shannon. 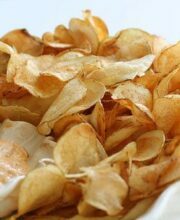 Using mandoline set at 1/16th inch, slice potatoes. Put all slices in a big bowl of water. Let sit for 20 minutes - 24 hours. Heat fryer to 375. Drain as much water as you can from the potato slices. Use paper towels to absorb any additional water on the surface. 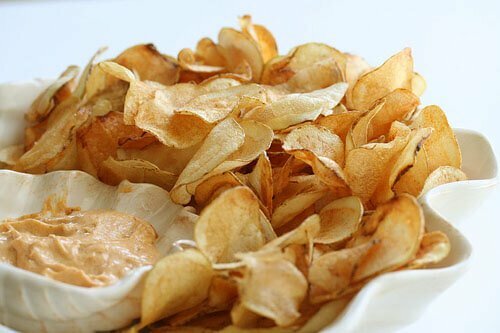 Place a batch of potato slices into the fryer (batch size really depends on big your fryer or pot is - just make sure that the slices do not stick to each other and all are under the oil. Fry until golden brown. Drain on a baking sheet with rack. While chips are hot, season with salt. In a bowl, combine all of the above. If have the time, I recommend that you make your own aioli. But, if you're like me and crave potato chips and MUST HAVE THEM NOW, store bought mayo will do.